PROTECT YOUR DOORS & ITS NAILS: If hate door scratches and unpleasant accidents when your pet is scratching its way out of the front door, then we got you covered. We proudly present you the greatest dog doorbell strap that will facilitate the potty training to the fullest! Have fun and ameliorate the communication with your pal! 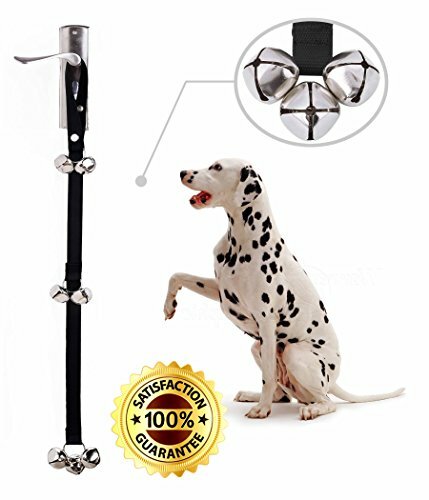 FULLY ADJUSTABLE TO YOUR UNIQUE NEEDS: Tired of dog doorbells not fitting perfectly? Did your dog lose interest in the bells because it couldn't simply reach them? If so, then this potty training bell kit is what you really need. Being easily adjustable, it conforms to your and your pet's needs! No more worries, no more aching paws! LESS BARKING, MORE FUN: This wonderful dog jingle doorbell is the perfect gadget to teach your dog proper manners. It can learn how to announce its needs and desires by simply scratching the bells. No more barking and nagging! You can carry it along while training your pal in the park or the woods. Hang it from your belt or even backpack. LOUD & CLEAR SOUNDS: Do not compromise with poor clarity doorbells sounds. Our housebreaking doorbell strap has 3 bells at the end of it! We can assure you that you will be able to hear the bells even when you are not in the same room. How cool is that? Now your four-legged friend doesn't have to wait anymore! GET THIS DOG BARKING DOORBELL RISK FREE: Since your satisfaction is our top priority, this product is backed by our lifetime money back guarantee policy! We are pretty confident that all of our products will accommodate even the most demanding needs! Hang this dog doorbell from door knobs, lamps, trees, baby stroller and cabinets. Make Dog Training Fun Again With An Xbells Dog Potty Training Doorbell! Feeling fancy today? Then why not go for the best of the best when it comes to your dog’s accessories and handy training gadgets? Because your little one deserves the best! Combing an excellent craftsmanship, durable yet adjustable Nylon strap and 3 jingle bells, this dog doorbell is an absolute must for all pet owners. No more barking! No more scratched doors! No more “leaky” inside the house accidents! Hassle Free Dog Housetraining Is A Reality For You – Give It A Shot Today! How many times did you wish your dog would come and say, “Come on, it’s time to go outside and urinate”. If the answer is many, then this housetraining dog doorbell is here for you! Facilitate potty training, housebreaking and home training whilst teaching your fluffy friend who is the boss around! This dog door chime should be hanged low enough for your puppy to reach with its paw or nose. Don’t forget to reward your baby every time it successfully rings the bells to go outside! Still Wondering If This Dog Doorbell Is The Right One For You? – Premium quality dog doorbells. 3 bells at the end of the strap! – Durable, abrasion resistant Nylon strap! It can withstand claws, scratches and bites! -Eliminate barking, promote a healthy living for your pet, ameliorate communication and raise an obedient dog! -Perfect for potty training, housebreaking, and home training. -Adjustable strap! Hassle free setup of both height and position. -Comfy handle snap! Hang it on door knobs, handles, your running belt, garage or anywhere that works out for your pet! Get yours today, while supplies last!